Since it’s humble beginnings in a downtown Manhattan loft in 1853, Steinway & Sons Pianos has been a favorite worldwide piano brand. Considered one of the “Big Five”, the renowned brand shares the concert stage throughout the United States and globally with Baldwin, Bechstein, Bösendorfer and Blüthner. Steinway pianos have long been considered the favorite of many concert pianist’s worldwide. B Natural Pianos and our online partners, PianoCloseouts.com and NJSteinwayPiano.com, specialize in a distinct group of used, restored and reconditioned Steinway grand and upright pianos. Steinway grand pianos come in different sizes, so you can easily find the best piano for your space requirements. In our Rockaway NJ piano warehouse and showroom locations, we feature a variety of pre-owned Steinway grand pianos in various sizes and finishes. 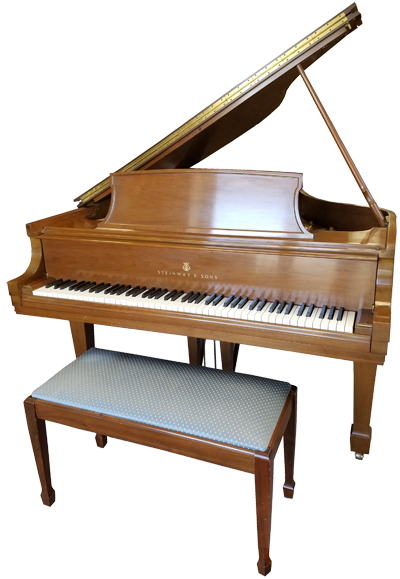 The most common sizes of used Steinway grand pianos are the 5’ 1” Model S, the 5’ 7” Model M, and the 5’ 10.5” Model L, sometimes referred to as their “Artist Grand”. Recently Steinway re-introduced the legendary Model A piano, measuring 6’ 2” in length, a medium-scale piano often called the “Salon Grand”. This size instrument was actually the smallest Steinway grand piano built and sold by Steinway when it was first introduced in the 1880’s. We always have a selection of vintage Steinways to choose from. Depending on the age and condition of these select instruments, many of our pre-owned Steinway pianos are carefully restored to perfection by Registered Piano Technicians and members of the Piano Technicians Guild. Our certified team of master-craftsmen completely evaluate every used Steinway piano in our inventory. Every Steinway piano is accompanied by a minimum of a 5-year warranty and a 100% trade-up policy for a period of 10-years. Depending on our used piano inventory, we often have special edition, pre-owned Steinway grands from the STEINWAY CROWN JEWEL COLLECTION, an exclusive and limited-edition series of instruments hand-crafted in exotic and rare wood species/finishes. 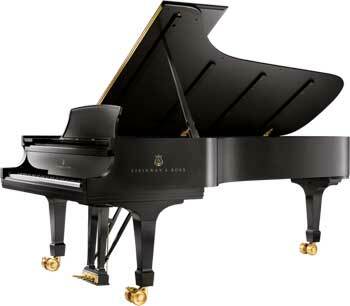 The Steinway Crown Jewel Collection was first introduced in 1999. Other “Art Case” grands and limited-edition pianos are part of our NJ piano inventory and can be previewed by appointment or 7-days a week, during regular business hours. 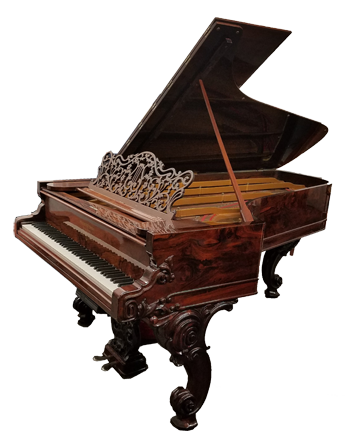 Originally built c. 1865, the instrument was completely restored in the 1990's by a certified Steinway & Sons rebuilder and tuner/technician. This historical, semi-concert grand features exotic woods, hand carved legs, lyre and music desk and beautiful art-case details. 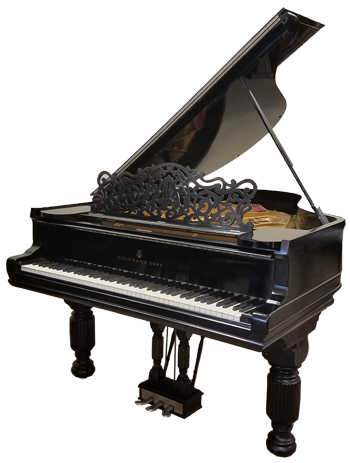 Steinway Model A – 6’ 2” – Serial #69245, Victorian Style Art Case Grand in Ebony Finish, originally built c. 1896. This powerful piano was restored about 20 years ago by Dryburgh Piano, one of the leading piano restoration houses in the New Jersey / New York metro area. The instrument boasts a clear and resonant voice with outstanding sustain. Originally built in 1967 - Serial #401218. This beautiful instrument is the favorite size of many piano teachers and small recital halls. The certified, pre-owned Steinway piano is in very fine condition, meticulously tuned and maintained by the original owner. Our certified team of craftsmen have approved the instrument after an extensive inspection and preparatory process, ensuring many years of reliability and performance. Included is a 5-Year guarantee on both parts and labor. Contact us today for rare savings on premium used Steinway pianos. We offer a labor and parts guarantee on every Steinway piano we sell. Your Steinway investment will also include our full trade up policy, so you can begin with a piano of your choice today, and trade it in on a new piano in the future with 100% of the original purchase price as trade-in credit. Are you interested in selling your Steinway? Please call 973-886-7414. We buy Steinway pianos of any size, year, condition or finish, anywhere in the United States. We will pay you fair-market value for your Steinway. If you are interested in restoring your Steinway piano, please request a free estimate and we will be pleased to provide a quotation including pick-up and delivery transportation of your instrument.